We are happy to announce a very special offer! 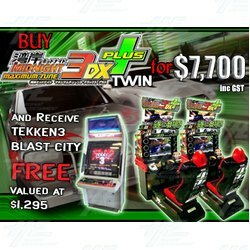 Buy a Wangan Midnight Maximum Tune 3DX Plus Twin Driving Machine valued at $7,700 and receive a Tekken 3 in Blast City Arcade Machine (valued at $1295) for free!! If you have been looking to add machines to your mancave, update your arcade center or expand your arcade collection, this is an offer that is hard to refuse! Wangan Midnight Maximum Tune 3DX Plus is the latest addition to the popular arcade racing series by Namco and includes additional cars, a new track, and extra customization options. The new cars available in this version are the GT-R (R35) and Skyline GT-R (KPGC10), and the new course added to this version is the Fukuoka Urban Expressway. The game also features new dress-up parts, making it possible to customize your car in any way you like. And this updated version sees the return of both VS Battle and Ghost Versus modes. Maximum Tune 3DX Plus is part of the hugely successful Wangan Midnight Maximum Tune franchise, which includes several other arcade driving versions of the game, manga, television series and a movie. This highly popular arcade series is well known around the world and with a number of card and online features, encourages a high continued play and replay value. This arcade driving twin will be a welcomed addition to any bar, club, arcade, commercial location or mancave! And now with our very special offer, when purchasing a Maximum Tune 3DX Plus twin, you will receive a Tekken 3 in Blast City Cabinet absolutely free! Thats right, free! Tekken 3 in a Blast City arcade cabinet is a highly popular 2 player video game cabinet from Sega. The cabinet is larger than most other Japanese candy cabinets, and the blast city cabinet also features a large marquee. Tekken 3 is the third installment in the popular fighting series. It maintains the same core fighting system and concept as its predecessors, but brings many improvements, such as significantly more detailed graphics and animations, 15 new characters, more modern music (modern at the time being 1997) and more fluid gameplay. Furthermore, Tekken 3 was the first Tekken to feature a beat 'em up minigame called "Tekken Force", which pitted the player in various stages against enemies in a side-scrolling fashion. If the player succeeds in beating the minigame four times, Dr. Bosconovitch would be a playable character (granted that you defeat him first). The Tekken fighting series by Namco is a hugely successful one, with games released on consoles, computers and arcade. With its huge popularity, new Tekken versions are continuely being released and Tekken 3 is one of the most highly sort after versions of the franchise. You will not be disappointed with such a formidable machine and game. To take up our incredible offer, please contact our sales team and make an inquiry. With massive savings such as these, the machines wont last long! !